Comprehensive GDP data revealed that Sub-Saharan Africa’s (SSA) recovery continued in the third quarter; however, the economy failed to gain traction from the previous period. Regional GDP expanded 2.7% annually in Q3, matching Q2’s result, which had marked the fastest growth since Q4 2015. A more accommodative global economy, higher commodity prices and buoyant infrastructure investment are largely behind the recovery. While activity in the region has picked up steam since 2016’s sharp slowdown, numerous macroeconomic challenges remain. Growth has been mixed across economies, with some flourishing, and activity continuing to be weak in others. Head on over to our Sub-Saharan African Economy page for more recent economic news on the region. Ghana has been one of the region’s top performers, and growth picked up to a three-year high in the third quarter. The economy grew at a stellar pace, underpinned by surging mining output as new oilfields boosted production. Uganda also grew robustly, expanding at the quickest pace in nearly three years thanks to a robust agricultural sector. On the other hand, activity softened in Kenya as two disputed elections disrupted activity and a drought weighed on the economy. In addition, growth in the region’s major players continued to be fragile. GDP growth slowed in South Africa, plagued by weak confidence and high unemployment. While the region’s largest economy, Nigeria, gained momentum, activity was muted overall, and the non-oil sector of the economy performed poorly. Available data for the fourth quarter suggests that activity remained broadly unchanged. FocusEconomics panelists see regional GDP expanding 2.6% annually in Q4. Growth in Kenya is expected to have picked up thanks to a quieter political scene, while higher commodity prices are supporting the region’s mineral and gas producers. Political risks to the region’s economy dissipated somewhat in December after the ANC elected Cyril Ramaphosa, a market friendly candidate, to be the president of the party at their national conference in South Africa. Ramaphosa is now set to be the party’s representative in the 2019 elections and campaigned on a platform to crackdown on endemic graft and corruption, and implement economic reforms. However, it remains to be seen how much influence Ramaphosa will have before the election, although some market analysts have speculated that current President Jacob Zuma could step down prior to the vote. The ANC came out of the conference deeply divided, which could limit how bold Ramaphosa will be in pursuing policy. 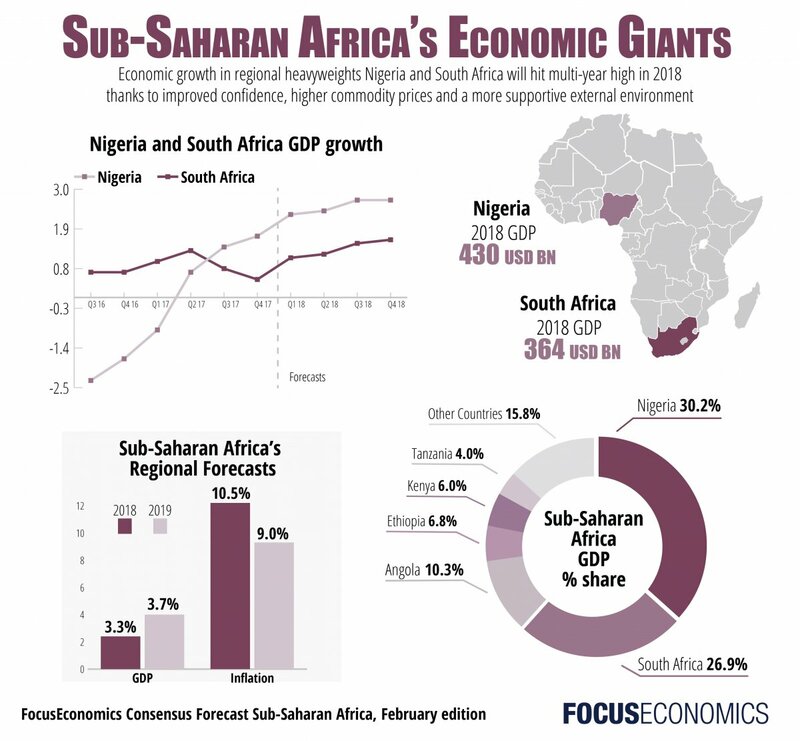 The Sub-Saharan African economy is seen expanding 3.3% in 2018, unchanged from last month’s forecast and above 2017’s expected 2.5% increase. Higher commodity prices and a rebound in the region’s major economies are largely behind the expected acceleration. However, there are several downside risks to the outlook. The regional economy is not well diversified, making it vulnerable to the evolution of commodity prices. While prices are expected to increase, this is largely dependent on the strength of the global economy, and of China’s economy in particular. Furthermore, a slower recovery in commodity prices than expected could dent the region’s prospects. Security concerns continue to threaten the outlook, and policy reforms are needed in many economies to strengthen the business environment and improve macroeconomic fundamentals, but it remains to be seen if there is political willpower for bold measures. On top of this, rising debt is a concern in many economies. In 2019, the region is seen growing 3.7%. This month’s unchanged 2018 growth forecast for the region was driven by diverging revisions across the region, as the economic performance across countries remains mixed. Four of the region’s 13 economies saw their growth prospects revised up, including the region’s second-largest economy, South Africa. However, this was balanced out by downgrades to the GDP forecasts of six other countries, including the largest economy Nigeria. Kenya, Tanzania and Zambia saw no changes to their projections. Ethiopia is projected to be the region’s fastest growing economy this year, with 7.7% growth, followed by Ghana with a buoyant 7.1% expansion. On the other hand, growth in the region’s heavyweights is expected to be moderate. South Africa is projected to expand 1.5%, followed by Angola with 2.1% growth and Nigeria with a 2.5% expansion. Recent data suggests that the economic recovery is gaining steam, although activity is still weak. GDP growth picked up pace in the third quarter due to faster growth in the oil sector; however, the rest of the economy performed poorly. Available data for the fourth quarter suggests that the economy is gaining traction: The PMI rose to a multi-year high in December and higher oil prices throughout the quarter bode well for oil production revenues. However, the outlook for the oil sector soured in January amid threats from militants. On 17 January, the Niger Delta Avengers vowed to resume attacks on oil infrastructure after their demands for a greater share of oil revenue were not met. Attacks on pipelines and other infrastructure were a factor in Nigeria’s oil production plummeting in 2016. In addition, although the Petroleum and Natural Gas Senior Staff Association of Nigeria—a major oil union—suspended a planned strike at the end of December, tensions remain high and threats of industrial action linger. The FocusEconomics panel shaved 0.1 percentage points off Nigeria’s forecast this month and now see GDP expanding 2.5% in 2018. While higher oil prices, recovering household demand and higher production will lift growth this year, still-high inflation and a weak business climate will keep the recovery modest. In 2019, GDP is seen expanding 3.2%. Recent reports suggest that pressure is mounting on President Jacob Zuma to step down. The decision would aim to improve the ruling party’s tarnished image ahead of the 2019 general elections and follows Cyril Ramaphosa’s victory as party president in the ANC National Conference held on December 16–20; Ramaphosa campaigned on a platform to root out widespread corruption. The South African rand rallied to a multi-month high once the electoral outcome became clear. Despite the initial optimism, FocusEconomics panelists remain cautious on the economic outlook. Some of the embattled president’s political allies were elected to key party posts, which could undermine much-needed reform efforts to lure investment and rekindle growth in an economy beset by high unemployment and low business confidence. Unemployment in Q3 remained steady at the multi-year high observed in Q2 and is keeping growth in private consumption constrained. In addition, data for Q4 is weak, underscoring the need to push through reforms to support stronger economic growth: The manufacturing PMI declined in December. The economy is expected to recover moderately in 2018 and 2019 on the back of higher prices for commodities. South Africa’s economic outlook will closely mirror political developments at home. FocusEconomics panelists expect the economy to grow 1.5% in 2018, which is up 0.2 percentage points from last month’s forecast, and 1.7% in 2019. The Central Bank of Angola removed its currency peg to the U.S. dollar on 9 January, in a major overhaul of the country’s exchange rate system. The long-awaited decision by the Central Bank resulted in an over 20% month-on-month drop in the value of the kwanza, and it could depreciate further. Although the devaluation will stoke price pressures in the short-term, it is a firm step towards eliminating market distortions that plague the oil-dependent economy. The previous exchange rate system failed to stem inflation and caused a scarcity of foreign currency, which stifled economic activity in the non-oil sector. The decision is the latest in a series of measures that policymakers in the country have enacted to jumpstart activity. In early January, the government also announced it intends to restructure the country’s external debt to ease the short-term debt burden, as the currency devaluation will result in a substantial increase in external debt denominated in a foreign currency. Structural imbalances will constrain GDP growth in the non-oil economy and keep growth subdued despite expectations of higher oil prices in 2018. FocusEconomics panelists expect GDP to expand 2.1% in 2018, which is down 0.1 percentage points from last month’s forecast. For 2019, growth is expected to reach 2.6%. Economic activity picked up in Q4 as the political scene began to stabilize. The PMI jumped above the critical 50-point threshold for the first time in eight months in December offering some respite to an economic picture that has long been bleak due to prolonged uncertainties stemming from the presidential election impasse, a devastating drought, and the government’s cap on commercial banks’ lending rates. GDP growth for Q3 showed the extent of the damage, with the economy growing at the weakest annual pace in close to four years. In a bid to bring the nation’s economic and social development back on course, the 2018 budget will be aligned to Kenyatta’s “Big Four” agenda, which prioritizes policy measures in the areas of manufacturing, housing, food security, and healthcare. Aiming to raise KES 40 billion (USD 0.4 billion) for infrastructure development, the Central Bank recently issued a tax-free, 15-year infrastructure bond listed on the Nairobi Stock Exchange on 22–23 January. Improving weather conditions should support a recovery in agricultural output, which together with planned infrastructure projects and expected higher investment inflows, should see the economy accelerate this year. The government’s interest rate cap policy continues to hinder growth prospects, however. Moreover, rising debt service repayments are causing growing concerns over increased borrowing, which could potentially lead to debt distress. FocusEconomics panelists forecast GDP growth of 5.3% in 2018, which is unchanged from last month’s forecast, and project it increasing to 5.7% in 2019. Preliminary data revealed that inflation continued to fall in December, hitting the lowest level since May 2016. Inflation eased from November’s 12.3% to 11.9% in December. Over half of the economies saw price pressures ease in December. Inflation has slowed since peaking in February, thanks in part to healthy harvests, which have calmed food prices. In 2017, regional inflation averaged 13.0%. For the region at large, price pressures are expected to continue easing in 2018, thanks to stable exchange rates, weak domestic demand and solid agricultural conditions. However, these factors are not at play in all economies. This month, Angola’s inflation outlook soured considerably after the Central Bank introduced a new exchange rate regime, which saw the value of the kwanza plummet. While the new exchange rate band should help stem the decline of the country’s international reserves, the weaker kwanza will likely stoke price pressures this year. The Consensus Forecast is for inflation to average 10.5% in 2018, which is up 0.2 percentage points from last month’s projection. The upgrade is due to higher inflation forecasts for Angola, Ethiopia, Nigeria, Tanzania and Zambia. In 2019, our panel expects regional inflation to average 9.0%.